Adam: Uncle Joe’s Coffee House/3rd Crack Coffee Brokerage. “Yirgy Bear” seasonal blend (Ethiopia Yirgacheffe Grade 1, El Salvador Finca el Aguila, El Salvador Finca Jocitillo) and changing Single Origins. Adam: Probably still be trying to make a living and struggling in the music industry. Adam: Filter for home. Hand grinder via Aeropress with Able disk, V60, or recently got back in to Syphon after a friend bought me a stainless mesh filter plate. Still adore the ceremonial aspect of filter brewing. Adam: That people have put their trust in me, and go out of their way to visit me every day. I feel honoured. Adam: Hmmm… too many artists to list here! Jazz, rock, electronica, hip hop, just depends on my mood. Music was a massive part of my life, so I have a huge diverse taste for it. Adam: Recently it’s been a lot of ‘clean eating’. Fresh food with no additives makes you feel super energized. My days of junk are long gone. Adam: Wow. Maybe one that sticks out in my mind was the first time I had Geisha. I can still remember the apricot and florals in my mind. We drank a lot that afternoon and I do remember wigging out at one point. It just tasted too good! Adam: There’re other drinks? It took me years to wean myself off the soft drinks, and apparently fruit juice is also evil… so mostly water or sparkling water. Can’t give up the bubbles. Adam: It was a job that I could have during the day, as music took up my nights. The attraction and loyalty that people had for their daily dose intrigued me and I fell in love with it. Adam: Haha! They only want me for my coffee, man. Adam: Something with subtle flavors that won’t detract from the coffee experience. Or definitely food first, and then coffee to finish. I live to enjoy the sensory experience. Adam: It’s a new job, so I am building the regular crowd now. The priority is consistency and quality. And feeding my OCD tendencies as a barista, that suits me fine. Adam: I used to work in a place where 17kgs or so was the norm for a quiet day. Weekends would easily break into the 20kg’s. It was manic. Adam: Most definitely! I pride myself on ‘what goes in the cup’ and believe that it is PARAMOUNT to making a name in this industry, as is serving your product with the utmost integrity and respect. We are the last representatives down the line from many people who have brought us this incredible thing called coffee, and if we do not do our job to the best of our ability… then many people suffer. Your cup and how you present it is a direct reflection of yourself. Adam: They become one with the Geisha force. Adam: King Kong brews a pretty sweet pourover, but Godzilla can easily do 10 leaf tulips in competition cups… hard to choose. Adam: In terms of the journey? Wow. I have made many changes over the years, and in particular, the last few years have seen the biggest changes to myself, my work ethic, and the amazing/influential people I have come in to contact with. I am constantly grateful for the things that happen, and I am equally amazed at what can happen when you least expect it. This is a hugely rewarding profession. Adam: Coming back from the USA and standing in customs, having a Customs Official tell me that on my forms I spelt ‘Barrister’ wrong… I replied ‘Indeed’. Adam: Man, so many! But right now, it’s kind of a combination answer. I love the ceremonial aspect of Japanese culture, so the location would be Maruyama Coffee, in Karuizawa. My guests would be Joe Hsu of Orsir Coffee, Antonio and Anabella Meneses, Wilford Lamastus of Elida Estate, and my closest coffee crew. We would (hopefully) partake in coffee these people would bring…(please?)! 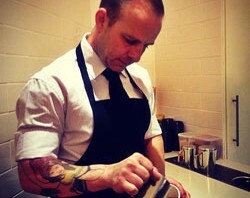 Adam: Right now I’m preparing for the 2013 Australian Barista Championships, and I leave in a few days. This is my first year of competition, I recently placed in the QLD regionals, and I have to say I’m hooked. Well, I’m scared and nervous as much as I’m motivated to succeed. So, all of my focus and attention is on this event. I have some amazing competition coffee, and cannot wait to present on that stage at an event filled with the cream of our industry. I am also getting married to my gorgeous girl this year, and she really is the rock/inspiration/mentor/muse for me. It’s a massive year ahead! Adam: Went for coffee of course! Adam: It’s probably equal. Good beans are a great start, but if the barista cannot prepare them in a competent way…. Adam: Please don’t cuss at me. Adam: Amazing tea has been around for centuries, but definitely the way people brew now has become more accurate. People are just more aware of the fragility of tea and the importance of careful brewing. Adam: I don’t drink a lot of tea, but I sure do like a good iced tea. Ugh, Queensland is hot. Adam: Hmmm…. But can’t I have them all? Adam: I’d really like to see it more accepted here in Queensland, though it is becoming more common in the specialty scene. What about a coffee house that only serves filter though? That would be an innovation. Adam: Definitely not. I think now the focus is on Roasters perfecting their lighter filter profiles. Many people are pushing the boundary, but some are still stuck in the ‘dark is better’ mindset. With so much going on now in this industry- and in Australia with the quality of grade we have access to- when I think about how many times I have changed my ways, or adapted, I believe this is the area that now needs to be addressed. Baristas are much more in control of what goes on in brewing, and the Roasters are so much a part of what’s going on here too. We should be working more in conjunction to achieve the final goal. But the ties are definitely getting closer now, and it sure is an amazing time to be a part of this movement and industry. I wouldn’t want to be anywhere else. This entry was posted in Barista of the week, Brewsflash, news2013 and tagged Adam Metelmann, Brisbane, Joe's Coffee, Noggi. Bookmark the permalink.